Sam Baker, 65, is a retired Chemical Plant Mechanic. He's keenly interested in Ford signs, literature (e.g., parts catalogs, brochures, etc. ), early Ford V-8s, and Flathead V-8 speed equipment. He shared a few items from his collection, along with a few recollections about his life as a Ford man. 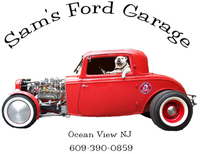 Sam says, "In 1975, I was working on a 1928 Model A Coupe, and went to the Carisle, PA, Fall Show. It was there that I discovered Ford Signs. I could only afford one, but I saw many that I liked." Not being able to travel very far to shows because his wife was ill, Sam found it difficult to buy signs "sight unseen." One of Sam's favorite signs is a 6" Ford stained glass window from a 1928 Ford Dealership. He also like his 8" Ford V-8 porcelian sign. When it come to signs, Sam's advice is "Buy what you like and buy it in person or from someone you know." i thourghly enjoyed the trip down memory lane. your rides are impressive and what i would call real fords. would like it if you had a sound track to go with ardun. the delivery looks like it is ready to haul groceries, furniture, flowers or what ever a customer could want and have it delivered with speed and class. Hi there, my name is Christine. My husband has an old porcilian Ford Service Entrance sign. We are trying to find out what it may be worth. Not sure how to find out. Your site was as close as I could get. Please if we could corespond thru e-mail. Thank you. Hi enjoyed your site. I have a old ford V8 sign. Was wondering what its worth. I have 1950 ford A-1 used cars dbl sided porcelian hanging. I was told it could be worth at least 3000.00 I have pictures, it has some damage to it would like to sell it.